Wild Basin exists to protect and maintain its urban wilderness and to promote the importance of environmental education, research, conservation, and preservation. 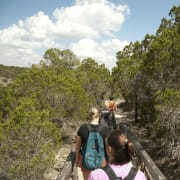 Through collaborations with St. Edward's University and Travis County, Wild Basin Creative Research Center serves as a local gateway to the Balcones Canyonlands Preserve, facilitating research, public awareness and preservation of Austin’s wildlands. In addition to the endangered Golden-cheeked Warbler, Wild Basin is host to several at-risk and threatened species of both flora and fauna. Wild Basin hosts field trips for local students year-round and relies on the generous service of dedicated volunteers to serve as trail guides. Would you recommend St. Edward's University Wild Basin Creative Research Center?